I love using my starter to create the most amazing sourdough breads but I do not always have time. Thankfully Cordelia (my starter) does not mind the lack of attention and she will happily sit in the fridge, feeding for a couple of weeks at a time. At the start of my December leave I decided that I would work on a new sourdough bread recipe, and to get Cordelia in the mood I fed her up quite a bit. Dave was still at work for the first two days I was on holiday, and using up some of my starter, I made myself sourdough waffles for breakfast. This was quite a treat, especially as I topped the waffles with ice cream. Needless to say I was getting a good balance of a few major food groups in one go. The starter I have is quite sour so I compensated by using more sweetness in the batter. I was going to slather the waffle in maple syrup, as you do, but when I went to get the bottle out of the fridge I discovered it had been used up. It would have improved my eating experience a lot, so I recommend that if you make these waffles that you make sure beforehand that you have a good syrup to go with them. Do you eat special breakfasts when you are on holiday? Dessert for breakfast? Delish! I’ve being using Celia’s leftover starter for pancakes so waffles are a good idea too. I’ll have to borrow my Mum’s waffle iron. This is Jaime coming by to say hi from the email snafu! LOL I totally had to come see these waffles because I am in desperate need for a good waffle recipe. 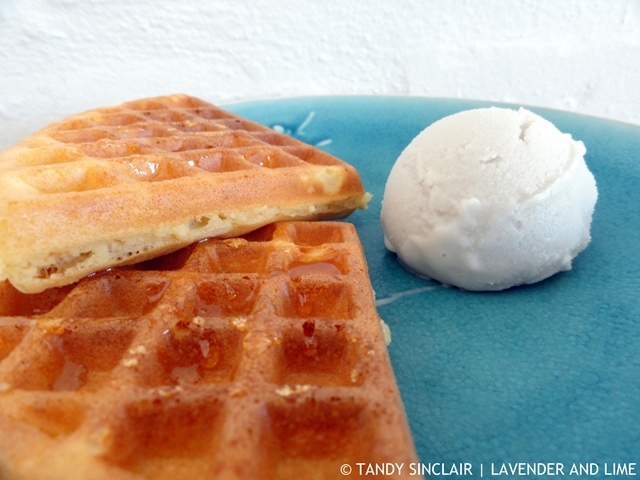 I’ve never had a sourdough waffle but I am so curious that I now must try your recipe! Yum! Deliciousness…. These waffles look mighty fine. Breakfast is my all time favourite meal of the day, so when I eat it (which seems to be only on the weekends) I make it super special. When on holidays however, I chow down on breakfasts, often more than once a day. LOL! Your are welcome any time Shashi! YUM! These look so good!! …and I do love a special breakfast! 🙂 Yummy! Your sourdough waffles look utterly amazing. I gave away my waffle maker after my divorce a few years ago… a friend had more use for it at the time than I did… but it might be time to get a new one! Have a GREAT day! Stay in touch! My daughter loves waffles and sourdough bread so I know she would love these! I love that you named your starter cordelia. I love waffles, but about 6 months ago, rest in peace, my waffle maker had bit the dust. This is the second recipe that I have read this morning for waffles and you guys are making me want to run out and get a new one from Fortress today. My boys love homemade waffles, with fresh fruit and of course piled high with whipped cream and all of the toppings. Wishing you a super day. Hi Tandy, love that you named your started Cordelia, what a lovely name. I am very interested in starters and how they work. Looks like you created a great one. I really need to hop on the sourdough bandwagon. These look SO good! Yes, yes and yes! Eating special breakfasts is totally a must on vacation (as is ice cream with EVERY meal!) Once a year, we try to make the 24 hour drive (straight threw!) from New York to Florida to catch a break from the cold here. And we always stop at a restaurants for strawberry crepes, it perks us right up! I bet he’d do the same with your waffles. I’m printing this now! Yummo.